When you add text to an image in Photoshop Elements, you can specify options for the text before you type. You can find several character and paragraph type settings on the Options bar. These options enable you to specify your type to your liking and pair it with your images. Specify your type options, such as font family and size, before you type. Fonts with no abbreviation are bitmapped fonts. Font Style: Some font families have additional styles, such as light or condensed. Only the styles available for a particular font appear in the list. Font Size: Select your type size from the drop-down list or just type a size in the text box. Note that type size is most commonly measured in points (72 points equals about 1 inch at a resolution of 72 ppi). You can switch to millimeters or pixels by choosing Edit→Preferences→Units & Rulers (or on the Mac, Photoshop Elements→Preferences→Units & Rulers). 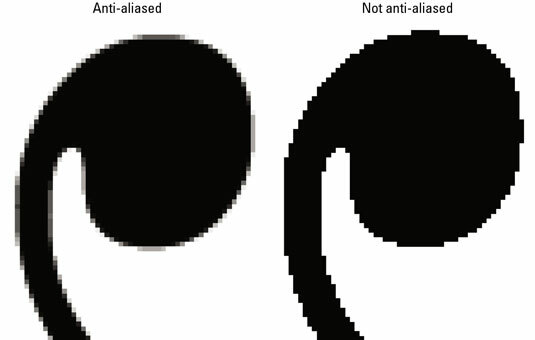 Anti-Aliased: Select Anti-Aliased to slightly smooth out the edges of your text. Anti-aliasing softens that edge by 1 pixel. For the most part, you want to keep this option turned on. The one occasion in which you may want it turned off is when you’re creating small type to be displayed onscreen, such as on Web pages. The soft edges can sometimes be tough to read. Anti-aliasing softens the edges of your type. Faux Bold: Use this option to create a fake bold style when a real bold style (which you’d choose under Font Style) doesn’t exist. Faux Italic: This option creates a phony oblique style. Underline: This setting obviously underlines your type, like this. Strikethrough: Choose this option to apply a strikethrough style to your text. Text Alignment: These three options align your horizontal text on the left or right, or in the center. If you happen to have vertical text, these options rotate 90 degrees clockwise and change into top, bottom, and center vertical settings. Leading: Leading (pronounced LED-ing) is the amount of space between the baselines of lines of type. A baseline is the imaginary line on which a line of type sits. You can choose Auto Leading or specify the amount of leading to apply. When you choose Auto Leading, Elements uses a value of 120 percent of your type point size. Therefore, 10-point type gets 12 points of leading. Elements adds that extra 20 percent so that the bottoms of the lowest letters don’t crash into the tops of the tallest letters on the line below them. Text Color: Click the color swatch to select a color for your type from the Color Picker. You can also choose a color from the Swatches panel. Style: Click this option to access a drop-down panel of preset styles that you can apply to your type. Create Warped Text: This fun option lets you distort type in more than a dozen ways. Change the Text Orientation: Select your type layer and then click this option to switch between vertical and horizontal type orientations. Cancel: Click this button (or press Esc) to cancel and keep the type from being entered. Use this option or the Commit option only after you click the Type tool on your canvas. Commit: Click this button to apply the type to your canvas.